AEM is proud to announce the release of its Analog EGT & Boost Gauges, the newest additions to its high-tech analog gauge line. AEM’s EGT & Boost gauges unite unsurpassed accuracy, speed and control with an easy to read, analog interface. The AEM analog gauges also offer a 0-5v analog output for use with data loggers and virtually any engine management system, such as the AEM EMS or FIC. The EGT & Boost gauges feature a K-Type Thermocouple or AEM 35psi brass sensor respectively, making them among the fastest and most accurate gauges available. The backlighting is user adjustable to 7 colors, allowing users to easily match the wideband gauge to most factory gauge clusters. Each gauge comes with interchangeable black & silver bezels and is available in black or white gauge faceplates. MORE ANALOG APPLICATIONS ON THE WAY! Following this release, AEM will be launching analog versions of the following display gauges throughout 2009: Water Temp, Oil Temp, Fuel Pressure, and Oil Pressure. 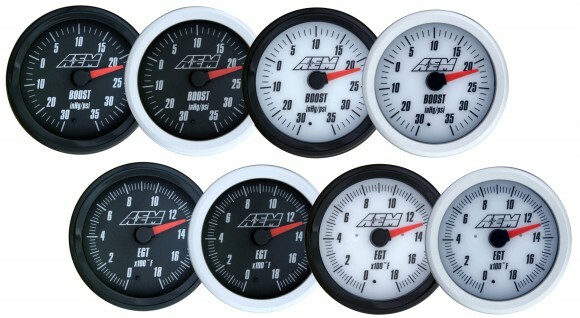 AEM has just announced a Price Drop on all their UEGO Wideband Gauges! Weather you’re running Gasoline or E85, whether you want an Analog Gauge or Digital UEGO Gauge, AEM has slashed prices. Viva la UEGO! New pricing comes in at a super low $277.50MSRP / $222.00 Jobber / $199.80 MAP.